This week we are returning to a discussion of hull form in response to several questions generated by an earlier blog regarding bow rise. It might seem obvious to desire a boat with low bow rise; that is, one that pops up onto plane rather than deliberately climbing up and out of the hole like an airplane lifting its nose to gain altitude. Surprisingly many boat owners are unaware that there is another option; properly designed boats do not need to point the bow at the sky before getting on plane. As mentioned last time, hull design as with so many other things in life is the art, or in this case the science, of compromise. Hulls designed to maximize performance at high speeds, say in excess of 65-70 + MPH, are traditionally very deep all the way aft. This is the central design feature of ocean race boats as well as the copy-cat cafe cruisers that achieve speeds high enough that in moderate to rough seas the boats become airborne. We’ve all seen the heart stopping images of Cigarette boats so far out the water the props are spinning in midair. Since the heaviest part or the boat is at or near the transom where the engines reside, it is the aft section – say station 8-10 – where the boat lands. So, the deeper the hull – in this case the greater the degree of deadrise – the softer the landing. Having raced off-shore myself in younger days, even the sharp entry at the transom does little to keep the driver from visits to the masseur, or in severe cases the orthopedic surgeon’s knife. Now for those of us who no longer hope to achieve flight in a boat and are willing to leave that to airplanes, helicopters and perhaps soon, large drones, we do not require such dramatic sharpness at the transom. It is to address this “more mature minded” boater that the folks at Hunt developed a hull form that while deep (high deadrise angle) farther forward where the bottom meets the ocean, but flatter aft. One of the best features of the Southport ride is its lack of bow rise when achieving plane. A helmsman never loses sight of the horizon or any other hazards lurking ahead while driving the boat. Many other brands can or try to make the same claim, but most achieve this by using prodigious amounts of power to overcome other design inefficiencies. The Southport hull does it with good design and construction. The hull form is designed with no compromises for things like blistering high end speeds or full V-berths and galleys forward. The boat develops its planing attitude from lift at the transom, a proper longitudinal (fore to aft) center of gravity, beam at the transom, and modest deadrise at the transom (22 degrees vs. 24 – 25 degrees). Because of the vacuum infusion method used on the hull and other major structural parts, each Southport model is lighter than a comparably sized boat from any other manufacturer. 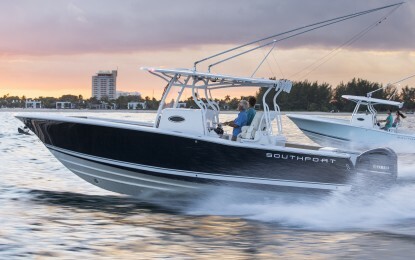 These factors help deliver the Southport’s signature ride and performance. So, for those boaters who want to see where they are going rather than a brief study of cloud formation, look for a hull form that is somewhat flatter aft and with extended chine flats to improve lift and lateral stability. Very nice looking boats. Do you make anything in the 13′-15′ range? I am looking for a tender for the mother ship. I have a unique slip that I own at my marina and it is an end slip by promenade that is shaped like a triangle. If I can find tender in the size I stated I can actually keep it tied to my ship and use it at my pleasure without having to walk to dinghy dock so that is why I am looking for a ship this size and after trying many ships out I have decided that I must have a hard bottom one as I do not want to deal with the risk of an inflatable deflating and it would also give me the option of going to the beach / sandbar/ island where small rocks may be present and cause deflation of the inflatable so that is what I would prefer to avoid if possible AND I have been told by many reliable sources in the a marine industry that a hard bottom while tow much betier behind my mother ship which would be a bonus as well as dual motors which would give me an extra bit of security if one were to go down I would not be stranded and I imagine top speed would be like rocket ship and I am not concerned at all about fuel economy as my mother ship burns outrageous liters of fuel as it is and lastly I need tender because I am slipped in the harbor and would like to hop around the harbor to different restaurants and bars whenever I would like to and not have to worry about drafts associated with my large mother ship not to mention the hassle of moving about in large ship so these are my considerations so please let me know if you are able to accommodate my wishes. Not sure i agree with what has been stated about lack of dead rise at transom. i have been fishing for years in Florida and have found that deep V back to the transom was or is my preference as you can take your time going out in the ocean but there are times when you have to make a fast trip back in due to rough seas. High and close swells on a plane can make a rough ride. Its up to the captain how the boat rides as he is in control and should know or have the experience for a safe and good ride. In my opinion, power and deep V is a couple of the first things i look for in any boat.